The second volume of Marydale's Thought for the Day continues to provide daily inspiration for those on the spiritual path. Just like the first volume, this collection of inspired thoughts can be read in order, or can be opened at random for guidance and direction in living your best life. "Since the publication of the first volume of Marydale’s Thought for the Day, Marydale has continued to receive daily inspiration from Spirit to share these original Thoughts with her friends, family, and members of the Param Yoga community. They are clearly striking a chord, as she receives emails every day from people who have been touched and motivated by these simple words of wisdom. As she sits, asks, and allows the Thought to flow through her, she is aware of the stream of Infinite Love and knowledge from which all creation springs. 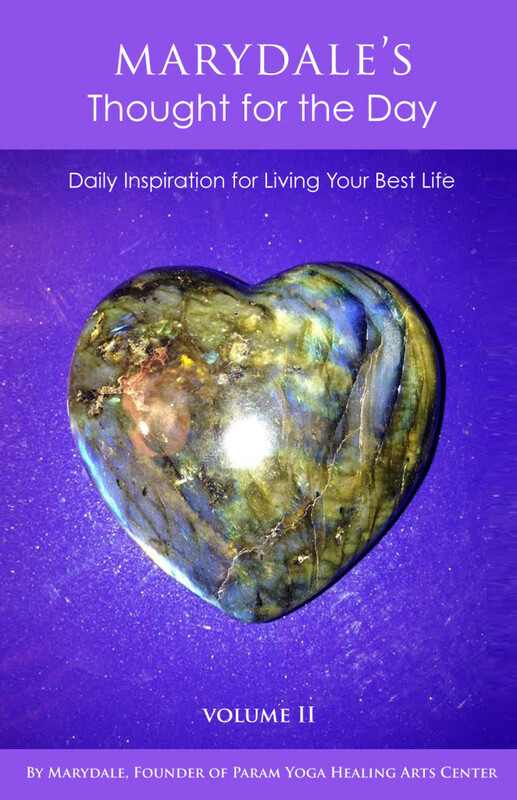 As you hold this book, ask your own questions, and open the pages at random, it is Marydale’s hope that her inspiration will become yours as it guides you toward living your best life." Please note we only accept Paypal for online payments.